HCMC party secretary Nguyen Thien Nhan present certificates of merit to artists. Attending at the event were former President Truong Tan Sang; former Secretary of the Party Committee of Ho Chi Minh City Le Thanh Hai; Vo Van Thuong, Politburo member, Secretary of the Communist Party of Vietnam's Central Committee; HCMC party secretary Nguyen Thien Nhan; Chairman of the municipal People’s Committee Nguyen Thanh Phong; Head of the Department of Propaganda & Education of HCMC Party Committee Than Thi Thu; representatives of State agencies, departments, together with cai luong lovers in the city. 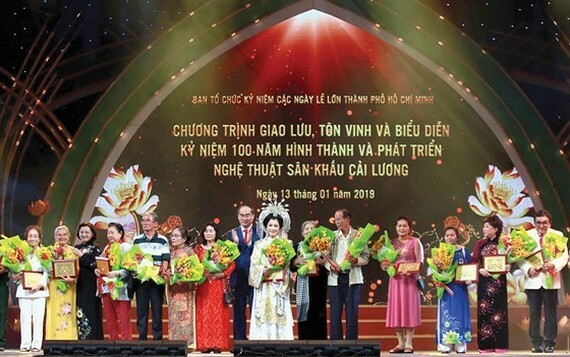 The large-scale event is one of the important activities marking the 100th anniversary of Cai Luong Stage and 320 years of Sai Gon-Cho Lon-Gia Dinh-Ho Chi Minh city. 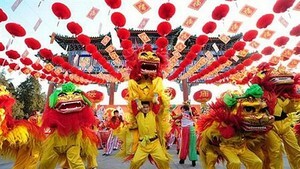 Cai luong (a form of modern folk opera) is particularly popular spiritual food of the people in southern Vietnam. It is the convergence of Don ca tai tu Nam Bo (Southern amateur music), hat boi (Vietnamese classic opera), and other traditional music as well as influenced by the type of Western musical theater. This kind of art has contributed to the culture, tradition, and character education, said Chairman of the municipal People’s Committee Nguyen Thanh Phong. After spending 100 years, cai luong was closely attached to the resistance against the French colonists and American intervention. The program presented to devotees performances of popular cai luong excerpts with the participation of more than 400 artists.